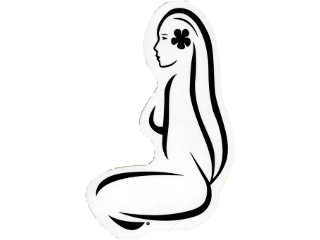 In Tahitian language, the "titi" means "chest of the woman." Thus, the "titi coco" as we heard frequently in the current language means a bra on coconuts. Cut in half a coconut, then it is polished and lacquered for greater comfort. It adapts easily to standard sizes for women. More flat, the model for girls is dug in younger and smaller coconut : it can be used until puberty according growth. Avalaible on order only (about 48 to 72 hours). Please indicate how old is the girl as ordering, in order to deliver you the good size.